Christians dressed in their tidiest clothes flocked to Sunday sermons in the earthquake and tsunami damaged Indonesian city of Palu, seeking answers as the death toll from the twin disasters breached 1,700 and officials said they feared more than 5,000 others could be missing. Indonesia’s disaster agency said the number of dead had climbed to 1,763, mostly in Palu. 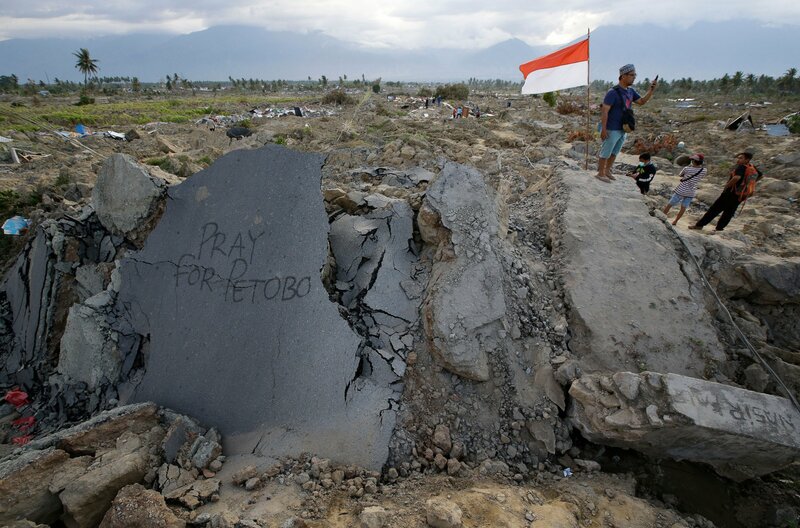 Agency spokesman Sutopo Purwo Nugroho said many more people could be buried, especially in the Palu neighborhoods of Petobo and Balaroa, where more than 3,000 homes were damaged or sucked into deep mud when the Sept. 28 quake caused loose soil to liquefy. “Based on reports from village chiefs in Balaroa and Petobo, some 5,000 people have not been found. Our workers on the ground are trying to confirm this,” he said at a news briefing in Jakarta, Indonesia’s capital. Nugroho said that efforts to retrieve decomposed bodies in deep, soft mud were getting tougher and that some people may have fled or been rescued and evacuated. More than 8,000 either injured or vulnerable residents have been flown or shipped out of Palu, while others could have left by land, he said. Officially, Nugroho said only 265 people are confirmed missing and 152 others still buried under mud and rubble, nine days after the magnitude 7.5 earthquake and powerful tsunami hit Palu and surrounding areas. The government targets to end search operations by Thursday, nearly two weeks after the disaster, at which time those unaccounted for will be declared missing and considered dead, Nugroho said. “This is for sure part of godly intervention, not outside the power of almighty God, that can’t be predicted or planned for by anything,” Malonda said. He said religious leaders are discussing holding inter-faith prayers but nothing has been agreed yet. Protestants, Catholics and Charismatics make up about 10 percent of the population of Palu, the provincial capital of Central Sulawesi. The province has a history of violent conflict between Muslims and Christians, though tensions have calmed in the past decade. Indonesia is the world’s most populous Muslim country. As searchers continued to dig through rubble Sunday, Central Sulawesi Gov. Loki Djanggola said local officials were meeting with religious groups and families of victims to seek their consent to turn neighborhoods wiped out by liquefaction into mass graves. He said on local television that survivors in the Petobo, Balaroa and Jono Oge neighborhoods could be relocated and monuments be built in the areas, which now look like wastelands, to remember the victims interred there. Officials have said that it is not safe for heavy equipment to operate in those areas and that they fear the risk of the spread of disease from decomposed bodies. In Jakarta, volunteers walked around thoroughfares empty of cars collecting donations for earthquake victims during the weekly car-free morning in the city center.